A great story mixing Junior Auskick Players from Vietnam and South Melbourne FC and AFL ASIA’s Vietnam Swans and Cambodian Eagles. A group of young Auskickers have returned from Vietnam after a once-in-a-lifetime trip to help spread the word about Australian football. For South Melbourne Auskick Coordinator David Wolf it was an idea that grew legs, and eventually wings. Wolf and five sets of father and sons have just returned from Vietnam after completing a mission to spread the joy of Australian football and NAB Auskick to South East Asia. After talking to one of the dads of a local SMD Auskicker, who just returned from living in Vietnam and was part of a unique Auskick program in the nation’s capital, Wolf started to plot a very different type of footy trip. “The concept was strengthened last year when I travelled to Vietnam and spent a few hours one night kicking a footy in the middle Ho Chi Minh City (Saigon) with my son. 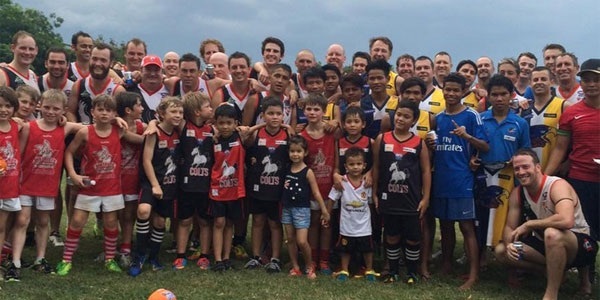 While on holidays, Wolf also caught up with Saigon Auskick Coordinator Kevin Hornblower, handing over the 30 footballs and kick-starting a now flourishing international relationship. “Over the past twelve months we kept in touch and earlier this year we received formal invitation to attend the Saigon Swans Auskick clinic then later that day play an exhibition match at half time of an AFL Asia Cup match,” he said. After months of planning, six South Melbourne Auskickers and their dads made the journey, taking their love of Australian football along for the ride. 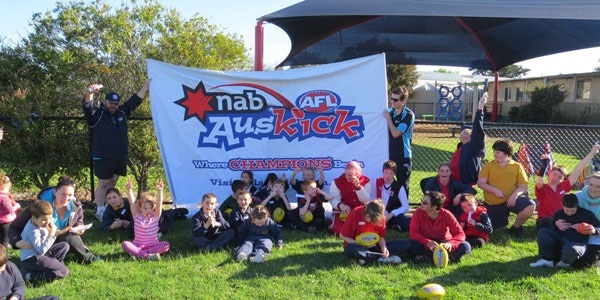 “It was certainly a little more appealing holding an Auskick clinic in 30 degree weather instead of five, and in the end there was about 35 local kids and our group that took part,” Wolf said. Wolf and his group of junior and senior ambassadors also took to the streets to hand out footballs and were again amazed by the joy it brought he kids and how days later they could be found still playing kick to kick in the streets. To cap off the remarkable trip, the SMD Auskickers, with a couple of imports, also took to the field at half time of the AFL Asia Cup match between the Cambodian Eagles and Saigon’s Vietnam Swans. Wolf said the trip had exceeded their expectation and the benefits were endless. Plans are already in place to bring a group of Vietnamese kids out for a massive football weekend earlier next year, and for a return trip with a new bunch of South Melbourne District Auskickers later in 2016. ◂ Aussie Teams fly up for the Bali Masters, Asia’s biggest Footy tournament!